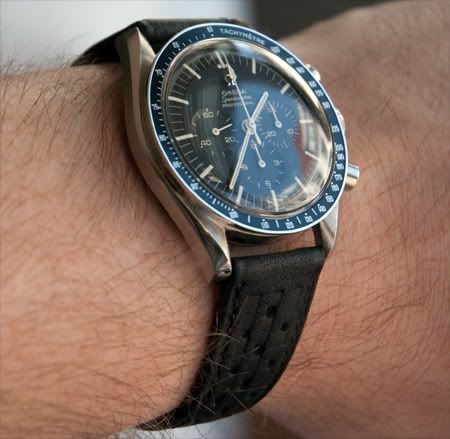 A few days ago, I posted a small message about a NOS (New Old Stock) Omega racing strap I bought via eBay. I picked it up from the post office last friday and today I finally had some time to remove the stainless steel bracelet and attach the NOS strap. Here is a first picture that I just took. Have a nice weekend all! Coming days/weeks you can expect some nice reviews and articles here on various watches. Among them are a lady’s Patek Philippe 24 in gold with 34 diamonds with satin strap (my girlfriend really liked this one), a Jaeger-LeCoultre Reverso and an Oris TT3 PVD.